Camper trailers are great for extended adventures and touring, even better if it is a 4x4 camper trailer made for off roading as base camp can now be set up in a hard to get to place. Off road trailers not only give you a spacious place to sleep at night, some even have full kitchens with running water with a sizable tank and gas from 1 or more gas bottles. Storage is another major advantage, especially on those longer trips. Extra fuel, water, fire wood, spare tyres and whatever else you can think of could be stored in or on top of the trailer. The Camper trailers range in price, $50,00 for a standard not for off road use with basic tent and storage to $50,000+ for luxury features including kitchen, fully DC powered switch boards with AUX battery, quality tent fabric, running water powered by pumps and loads more features. There is a huge price gap between the basic and the luxury versions, but there are plenty of great options in between the basic and the most expensive ones. See Ronny's thoughts and conclusion, taking a Camper Trailer off-road for a week. What Facilities Do You Need In Your 4x4 Camper Trailer. Consider what you require, is it a basic setup for caravan parks? rough tracks off road trailer to go anywhere? full luxury for caravan parks? luxury with rugged off road capabilities? or perhaps even custom made? You can find something in the mid range budget to suit most needs. Setting up a camper trailer does require a bit more space depending on the size of the tent. Most Camper trailers have the beds on top of the trailer which is very convenient as these are already made up ready for sleep after a full day of 4 wheel driving. Wind drag is not much of an issue when towing a camper trailer as they sit quite low compared to a cumbersome caravan, obviously fuel usage will suffer a little but nowhere near as much as towing a caravan or a big boat, depending on how much is loaded onto the trailer. The weight will make the real difference. Before venturing into the bush on tight tracks with a camper trailer a driver will need to be very skilled at reversing, don't let this discourage you as I'm only referring to rugged tight tracks and trails. 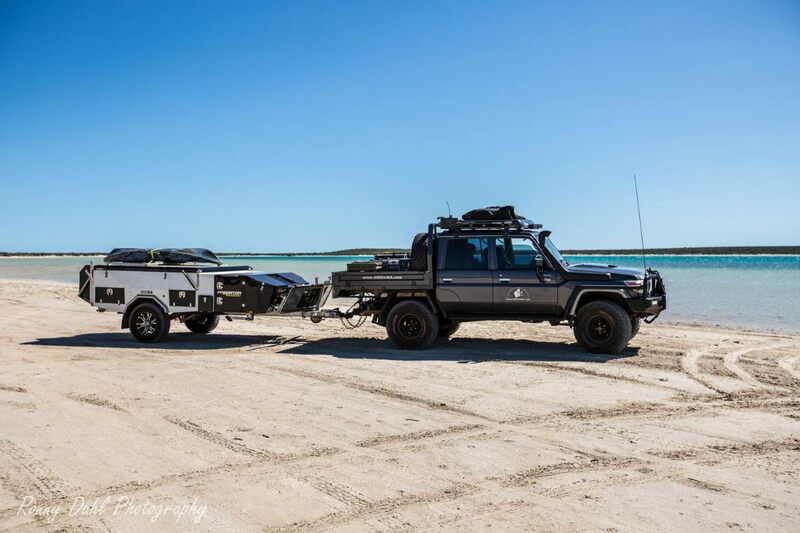 Leave 4x4 Camper Trailer And Go 4 Wheeling In Western Australia.